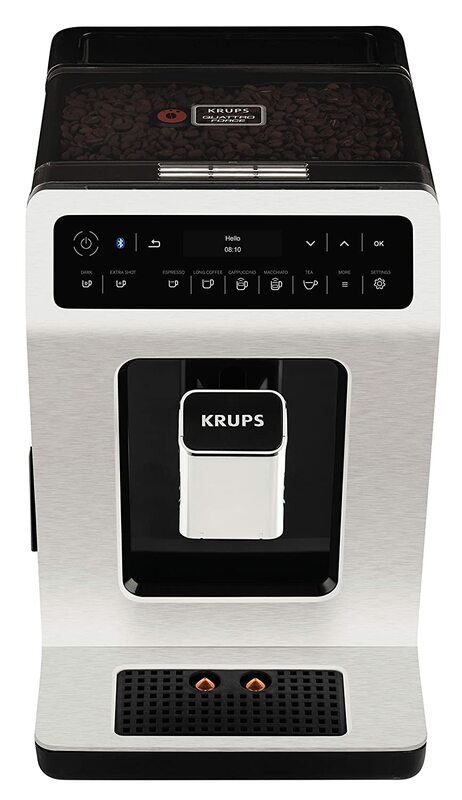 We have previously featured the Krups Evidence in our round-up of the best bean to cup coffee machines – so if you’ve previously read that article then you will already know that we rate it highly. But as one of the more expensive BTC machines available, we thought it was probably worth a more in-depth review to really get under the hood and take a look at the features on offer, the pros, and the cons. The Evidence is quality throughout. Looks great and is very solidly built with a 2-year guarantee. The unit is really simple and intuitive to use via the bright OLED touch display and is jam-packed with features including 15 one touch drinks – all of which are customisable – and a smartphone app for storing favourite drinks and making drinks remotely. Some of the features are a bit OTT and gimmicky in our view but others may find them useful. The coffee produced is good and the milk frother performed well when making cappuccinos and similar drinks. The price is on the high-end, but other than that it’s hard to find fault here. Aesthetically, all look great so it’s really a matter of choice, however, the metal and chrome versions will set you back a bit more cash. From a size point of view, the Evidence measures 48cm x 38cm x 28.8cm. We found this to be reasonably compact and didn’t take up so much counter-top space such that it proved an annoyance or hindrance – but it obviously depends how big your kitchen is and how much space you have available so it is definitely worth a measure up before purchasing. As has already been mentioned, this is one of the more expensive BTC machines, so it is pleasing that the build quality is good, with the unit feeling solid and sturdy and not plasticky or flimsy in any way. The separate milk frother plugs into the front of the unit if you are making cappuccinos or other similar drinks and with its brushed metal finish, also looks pleasant. The unit also comes with a 2-year guarantee. The Evidence is packed with features. There are 15 different one-touch recipes – 7 for black coffees, 5 for white coffees and 3 temperatures for teas (although it is very unlikely you will be buying this to make teas, I guess it is a nice option to have). Each of these recipes is completely customisable so for instance, you can add an extra shot of espresso if you like your coffee stronger. All of this is controlled via the OLED touch control screen, which is nice and bright and really intuitive. I had no issue navigating the options and understanding how to adjust and change the drinks and it was simple and satisfying to use. Any drink customisations can be saved to the Krups app on your phone or tablet, which can also be used to keep track of maintenance schedules and even brew remotely – meaning you don’t have to get off the couch to make your brew, although I personally find this to be overkill, as you still have to get up to put your cup under the nozzle and collect your drink so it isn’t really a time saver in my view and feels like a bit of a gimmick. There is space under the nozzle to fit 2 cups at a time which is pretty much essential in a good coffee maker these days. Other features include automatic descaling, rinsing and cleaning programmes, empty water dank detection system, programmable auto-on and off and removable water tank and drip tray. This unit has pretty much every feature and function you could ask for in a BTC machine. The quality of the coffee produced is excellent and we found no problems with lukewarm cups. The milk frother also did a great job when making cappuccinos and other frothed milk drinks. To see a few more of the Evidence’s features in action, check out the video below. Overall, the Evidence is a really good bean to cup machine. It’s really well built and looks great, is packed with features (some of which are a bit unnecessary but nice to have), is simple to use and produces good quality coffee – so it’s hard to find fault. It is expensive and there are cheaper models out there that will do as good a job when it comes to the actual coffee making, but it would be a worthy purchase for any coffee aficionados looking for the convenience and ease of a BTC machine.